A wonderful opportunity to appreciate the splendid beauty of Singapore from both land and air! Singapore City Tour with Flyer experience while our city-tour gives you an up-close view of attractions like Merlion Park, Suntec City, Fountain of Wealth, Orchard Road, and Little India as well as China Town, the Singapore Flyer ticket allows you to soak up the incomparable sights over the skyline of the city-state during your 30-minute flight aboard Asia’s biggest observation wheel. 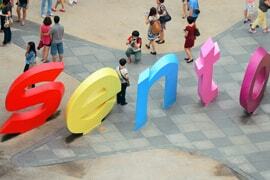 This attraction of Singapore’s is a highly famed island getaway, Sentosa. You’ll have a chance to enjoy one-way Singapore Cable Car ride and appreciate the marvelous beauty surrounding the region. Visit Madame Tussauds, and also watch fascinating shows including Images of Singapore LIVE as well as Wings of Time on this approximately eight hours tour. Apart from pick-up and drop off from your hotel, the tour includes free snacks and refreshments. Fancy a mini break full of amazing experiences? Book Rayna Tours’ ‘Quick Getaway Singapore’ which offers three well-planned nights to take in the distinct charisma and spellbinding wonders of one of Southeast Asia’s most favored holiday spots. Discover the most famed as well as treasured attractions of Singapore on a city tour. Besides photo ops at the legendary Merlion Park, you’ll journey through a mix of glamorous and cultural sights in the city. This mainly covers Marina Bay, Orchard Road, Suntec City, China Town, and Little India. 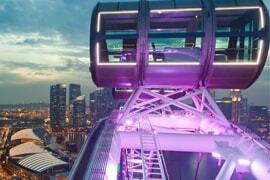 As part of this tour, you’ll also get a chance to soar high above the region’s stunning sights, with an invigorating spin aboard one of Singapore Flyer’s 28 glass capsules. This colossal Ferris wheel will feast you with mind-boggling vistas that extend for more than 45 kilometers. Half day Sentosa Island tour is another highlight of your quick Singapore getaway. For a bird’s eye perspective over the enthralling island views including Merlion Statue, take a cable car ride from Faber Peak to Sentosa Island. 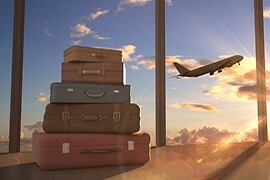 Moreover, attractions like Madam Tussauds Museum, IOS Live, Wings of Times, and Luge & Sky Ride assure you of some unforgettable moments during your vacation. Great tour package to Singapore! A long weekend was coming up and so when I came across this tour package, I booked it immediately. The 3 days were absolutely fun. I and my husband enjoyed the city tour while the kids had a gala time at Sentosa Island. The Wings of Time show was spectacular! We would like to come back to Singapore and spend a few more days to explore the city. We would definitely choose Rayna Tours next time too. I really appreciate Rayna Tours' services. Every request regarding my tour was attended with politeness and promptness. The tour itself was efficiently planned. Although we had some glitches during the holiday, it was solved within few minutes and we were able to enjoy our time in Singapore. I highly recommend Rayna Tours to my family and friends.